If you've ever seen the movie Jaws, you probably have a healthy fear for what lurks beyond the water's edge. In fact, many Americans suffer from minor cases of Galeophobia or Selachophobia – a deep fear or dread of sharks. What you might not realize is that you're far more likely to have a fateful encounter with a potentially deadly deer than with any kind of shark. 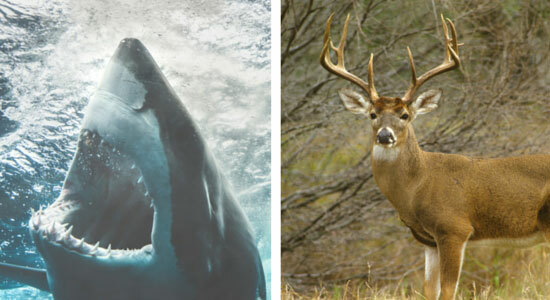 In the list of most deadly animals to humans, deer outpace sharks by a rate of nearly 200 to 1. In the United States, there are approximately 50 shark attacks recorded each year. Of those attack instances, they average only one death per year. Statistically, you're more likely to die walking on the beach than swimming there. According to studies from 1990 to 2006, there were 16 deaths due to people falling in holes at the beach, compared to the 11 shark attack deaths on record during that time. On the other hand, there are over 1 million deer-related car accidents per year in the United States. Of those 1 million accidents, nearly 10,000 people suffer injuries of some kind. Deer-related car accidents account for approximately 200 deaths per year and over $1 billion in property damage. In Mid-October through Mid-December, we see a drastic rise in deer-related car accidents, especially in Pennsylvania – where drivers have a 1 in 71 chance of colliding with a deer. 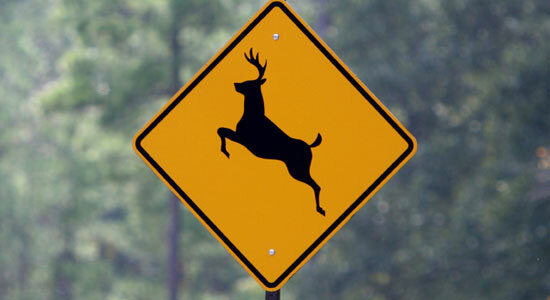 Recently, a study was posted listing the top 10 states where drivers are most likely to be in a deer-related accident. It might feel like the odds are stacked against you when it comes to deer-related accidents. It's hard to predict these wild animals' movements, especially when they dart into the road. We've come up with a couple of safety tips to consider as you try to prevent deer accidents this season. Take your time and slow down, especially on back roads near wooded areas. Look out for deer crossings and scan the road accordingly. Deer are more active at dusk and dawn than other points throughout the day. If you see one deer, assume there are others nearby. Don't swerve to avoid deer. Brake and stay in your lane. Most injuries and fatalities come from drivers who swerve into oncoming traffic or into trees and telephone poles. During hunting and mating season – October, November, and December – deer are particularly active. Drive cautiously and take your time when using back roads. With deer accidents as prevalent as they are in Pennsylvania, it may seem impossible to get by without hitting a deer. But as long as you take the proper safety precautions, you can navigate through fall and early winter without too much trouble. Stay safe and keep looking for those deer. They're liable to jump out when you least expect it.